This media supports the DVD-R for general use drives from Pioneer, Panasonic and others. The Verbatim DVD-R for data media has a lifetime warranty and is fully compliant with the DVD-R General specifications established by the DVD Forum. Ideal for storage and archival of critical information, the Verbatim DVD-R for data media can be used for financial data, legal files, government records and medical images that must not be altered or overwritten. It is also ideal for consumers who want to share their videos with family members. Corporations can also use this media to replicate training courses, marketing videos or multimedia presentations. Similar in usage as DVD-R for Data described above, Verbatim's DVD-R for authoring is for professional authoring drives. Because of its rewritable capability, Verbatim's DVD-RW for data media allows you to edit and incrementally update files on the disc. It offers a lifetime warranty and is fully compliant with the DVD Forum's specifications for the DVD-RW format. Being cartridge-free, the rewritable Verbatim DVD-RW media provides read compatibility with both DVD-ROM drives and DVD-Video players. It is a single solution for both real-time video recording and data recording, with the ability to protect content from unauthorized copying. This media also makes the job of combining digital video and digital data in multimedia presentations easier and cheaper. Now you can fine-tune your video without having to write another "one-shot" DVD-R disc that will need to be discarded with each new version of the presentation. Because of multi-session writing capability of DVD-RW, you can easily add documents, data or video segments without having to open and close write sessions. Now you can edit and author a video on a DVD-RW drive and when you're satisfied with the results, play the disc back on any standard DVD-ROM drive or DVD player. Verbatim's DVD-RW for data is compatible with the industry-standard UDF (Universal Disc Format) data storage standard endorsed by OSTA (Optical Storage Technology Association). This standard provides for the efficient reading and writing of small amounts of random access data. This insures that data written to the disc can be read on nearly any computer platform. can be written, read and overwritten more than 1,000 times. For video applications, the DVD-RW format uses advanced "lossless linking" so variable bit rate recording can be used for longer playback. Constant Linear Velocity technology is used so video can be quickly streamed to the media. For data applications, the disc rotates at a constant speed (constant angular velocity) to provide fast, random-access reading. Verbatim's DVD-RAM family of media includes the single sided 4.7 GB bare disc and removable-cartridge discs, as well as the double-sided 5.2 GB and 9.4 GB media in protective cartridges. DVD-RAM media allows you to save, update and overwrite files just like you do with your standard hard drive. has an MSRP of $42 for the 4.7 GB bare disc DVD-RAM media and $70 for 9.4 GB double-sided media cartridge. Verbatim DVD-RAM media has been tested and certified compatible by two of the DVD Forum's DVD testing labs. The 2.6 GB/5.2 GB and 4.7 GB/9.4 GB DVD-RAM drives from AOpen, Hitachi, LG Electronics, LaCie, Panasonic, QPS, Samsung, TEAC, Toshiba and other leading manufacturers are supported. 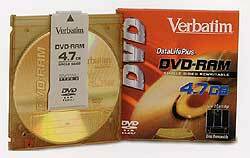 Data and videos recorded to Verbatim 4.7 GB bare DVD-RAM discs or removable cartridge media can be played back by more than two dozen DVD-ROM drives, nearly a dozen DVD players and six DVD recorders available today.